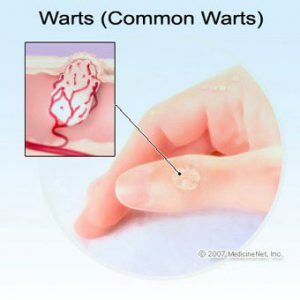 Warts are caused by the Human Papilloma Virus (HPV); The virus causes skin to grow faster than usual, forming a bump. Though HPV is contagious, touching someone with warts does not mean the other person will definitely catch the virus. It depends on the particular strain of HPV and on the strength of a person immune system. Breaks or cuts in the skin may make infection more likely. Warts can develop anywhere on the foot, but typically appear on the bottom of the foot (plantar side). 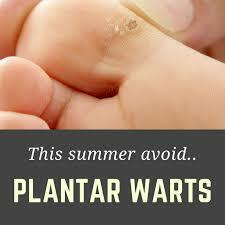 Plantar warts grows deep into the skin, were usually this growth occurs slowly. Solitary warts is a single wart. It often increases in size and may eventually multiply, forming additional “satellite” warts. Mosaic warts are cluster of several small warts growing closely together in one area; mosaic warts are usually more difficult to treat than solitary warts. The FOX laser is commonly used as a final step in procedure, to accurately burn remaining tissue/ leftover infected cells; the laser intense power is able to vaporize viruses and destroy infected cells. The FOX laser advantage is that it doesn’t cause extensive tissue damage, it’s precision optical hand pieces are designed to target only very small areas and allow for superior precision and minimal tissue damage (as well as faster healing). Coagulation is a non-ablative treatment, achieved by applying focused laser radiation, which dry the wart by coagulating its capillaries; laser radiation eradicate the Papilloma virus, since IR laser radiation causes intense heat at a sub dermis level. The dried tissue will separate from the healthy tissue underneath and fall off during the following days. In some cases blistering may appear, which promote the healing process. We have found through the years at the clinic, that an application of a topical freezing agent such as Lidocaine, children find this procedure painless and are able to tolerate it with no major issues. This topical cream is available in your local pharmacy behind the pharmacist and can be applied prior to you apt for aprox 30min to and hour.